Editorial, D S Bell & J Gaffney. European Immigration Policy. The need for solidarity, E Pisani. 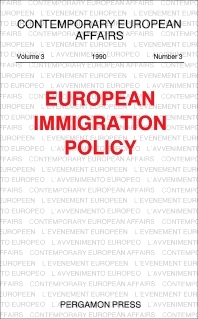 Immigration and the European Community, G Callovi. Europe's immigrants, S Nair. Fortress Europe and human rights, P Leuprecht. Immigration and the French experience, C-V Marie. A common future, P Greib. Christians and future immigration policy, A Perotti. Schools and cultures in France. Pitfalls and prospects, A Seksig. Immigration policies and the Single European Market, J Costa-Lascoux. European Dossier. Spain's illegal immigrants, IOE Group. Marginality and minorities in France's immigrant population, F Dubet. Citizenship, nationality and internationality, G Raulet. Literary Chronicle. Of Central Europe: myths and reality, C Magris. Book Reviews. Max Gallo and the left, S Nair (Review of La Gauche est morte,vive la gauche by Max Gallo). A future for the left? E Shaw (Review of The Progressive Dilemma by David Marquand). European Immigration Policy is devoted to the problems of minorities and immigrants within the European Community. It includes many papers drawn from the Strasbourg Conference of December 1990. An introductory paper argues the problem of immigration as neither prevention nor reduction, but of appropriate development planning for the South and the political management of the migrations which must take place largely due to the economic requirements of the Community itself. Further essays discuss the position of immigrant and migrant peoples in the Community, contemporary immigrant and nationality policies, Christianity and immigration, Spain's illegal immigrants, and the integration or marginalization of immigrants in French society. For professionals and academics interested in the policy and practice of European immigration policy.